This is not the photo I chose for my holiday cards this year.. If you would like to find out what photo worked for me, you can send me your address, fill out the postable form, or wait until Christmas when I'll post it. Don't forget I also have a Tails from the Foster Kittens calendar for sale this year. But, they're so flippin' cute piled up in the tree!! I think this is the only kind of tree that my cats can handle. So far they have not climbed on my ceramic tree. Do you ask Catman to help you with photography? I'm betting he can get the cats to do anything! 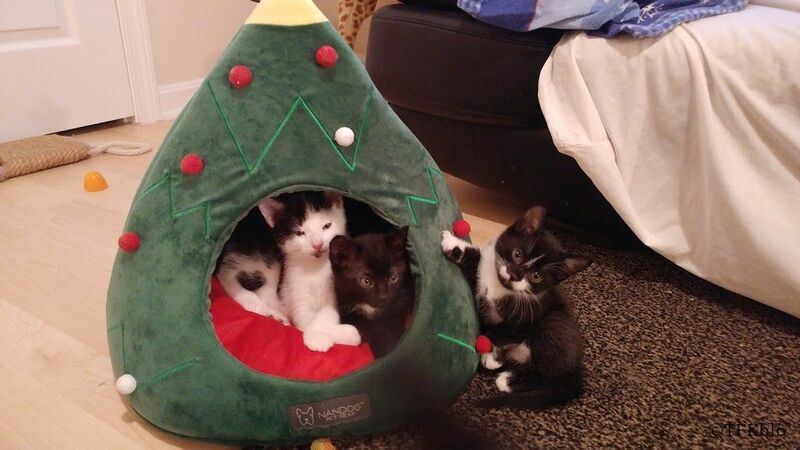 I love this kitty Christmas bed!